An enthusiastic Day 2, marked it’s end after the departure of the French delegates and the host school members from the school in the evening. Although, the twilight marked the end of the day but it ceased for the new commencement. The beginning of the new morning of Day 3, was commemorated vigorously. The intensity of our acquaintance and warm welcome proved conducive when our delegates adorned themselves beauteously in traditional Indian garb provided by the host family. A special Assembly was held by students of class IX on Diwali. The performance of the K.R.Mangalam students spellbound the French Delegates. The students of the host family dramatically presented the Ramayana. The purpose was to familiarize our guests with the Hindu mythology & the reason behind the magnificent celebration of Diwali festival. The assembly was impeccable. Then, the students of the French Exchange program were taken to the school reception to light the diyas. This was a mesmerizing experience for our French Delegates. The atmosphere was completely positive. Our guests were amazed to know that lighting of the diyas signified purity, goodness, good luck and power. The light emitted by these diyas eliminated the spiritual darkness, which led to self-realization. Followed by the diyas lighting was a fruit break to rejuvenate our guests. This short break energized them for the next event which was a Rangoli decoration competition in the Multipurpose Room. The competition not only brought resplendent Rangoli patterns but also the hail-fellows together. The way colors fused with each other in the Rangoli design, the cultures amalgamated as well. Rather than being a guest and a host family, we were the unified one. There were 6 participants in each group & 7 teams participated in all. Even the judgement of the best design baffled the judges. Finally, the dilemma was resolved by awarding Team 3, Team 4 & Team 1 as Ist, IInd&IIIrd positions respectively. Everyone was cordially involved. The team work was marvellous. The diya decoration competition was carried out in the same Multipurpose Room on the 3rd floor. This creative competition brought best of the talent& imagination in the forefront. Each group had 2 participants. Eventually, Team 14th stood Ist, Team 17th was judged as 2nd& Team 11th was proclaimed 3 rd position. It was not at all surprising when a consolation prize was shared by another two teams i.e. Team 4 & Team 18. Diyas were embellished so well, that it couldn’t be even speculated that it was the first ever endeavour of the French students. It was also a day of Diwali celebration in K.R.Mangalam School. All the classrooms were decked up for the day. The students of the school were too dressed up in traditional Indian attire. 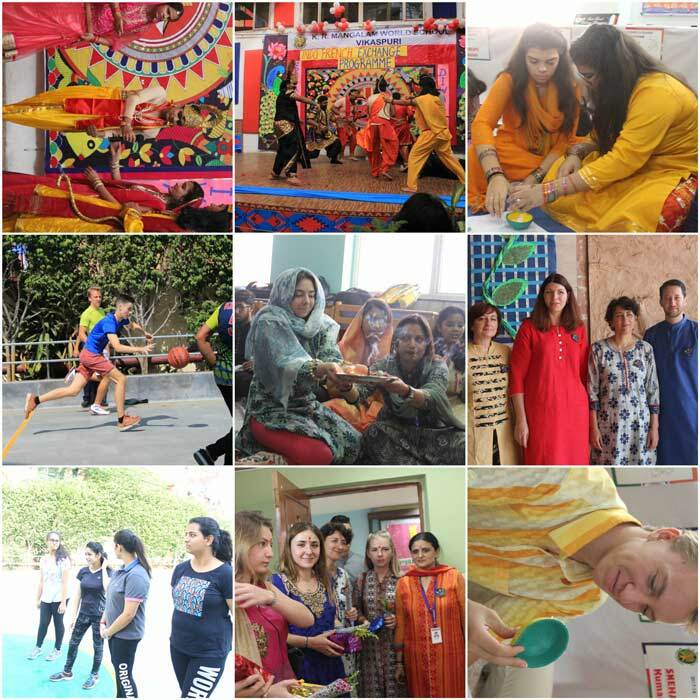 Students of French Exchange Program visited all the classrooms to be an active participant of the Diwali rituals. Senior Coordinator ensured that the prescribed rituals for the festival were followed reverently. She herself offered hymns in the honor of Goddess Lakshmi. Once the ceremony ended, the students and the teachers were offered refreshments from the school. Everyone was joyous and merry. Our delegates were no more mere spectators now. Their team participated too in the basketball match. Group 1 was led by the girls team and group 2 was the boys team. The loud cheers of the audience spurred the participants. The host school, K.R.Mangalam School, girls won the match against the French Girls Team, however, the French boys took the lead in boys team. The spectators had no bound to their joy. It was an amiable match. Finally, the students were dispersed from the school.